Here's a news story that should stir deep horror in even the most jaded reader. Cornell University will build a food printer. Personal home technology has changed the world, and many people - for example io9 writers - depend on it for their livelihoods. Unfortunately, we have officially Gone Too Far. No, there isn't going to be a pen of velociraptors inexplicably next door to a theme park. Instead, there will be "printed" food. 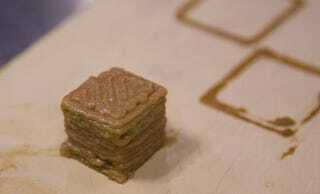 Cornell University is building a 3D food printer. The contraption will allow people to load vials of liquified food into the printer as inks. They can then set a 'recipe' that will make the printer arrange the liquified ingredients in a particular way. The printer will do the rest, presumably while the person chugs a bottle of pepto-bismol and puts their head between their knees. The engineers of the food printer are stessing its advantages. The liquid ingredients will store well and use space in the kitchen efficiently. Each person will be able to slightly tweak recipes to make cookies more flaky or meat more moist, according to their personal taste. The food printer can also pull off some neat arrangements, like embedding letters in cookies. It's even been able to build a 'dome' of turkey and individual servings of sushi. It would also be a great concenience to those with no culinary ability. That gourmet truffle up top, for example, is a turkey cube with celery filling. To be fair, there is alread a lot of industrialization in food production. Most people getting processed food would not like it as much if they saw how it was made. But is dot matrix cooking the way of the future?